ZHOUQU, Gansu - Amid sirens and horns wailing, people across China Sunday stood in silent tribute to victims of a massive mudslide in a remote northwestern town. Chinese leaders, citizens, students and workers across the nation paused for three minutes at 10 am Sunday, a week after the devastating mudslide hit Zhouqu County, in Gannan Tibetan Autonomous Prefecture of Gansu Province. At least 1,239 people have died and 505 are listed as missing. At the Dongjie Village in Zhouqu, more than 5,000 rescuers and villagers stood still on the debris of mudslide, bowing their heads in commemoration of those killed in the disaster. A huge black banner written in white words hung in front of the mourners, with wreaths laying around. The banner reads, "Mourning in deep grief for deceased compatriots of the Zhouqu massive mudslide." "I only feel sad as I stand on the debris of our homes," said villager Zhang Xiujuan. "Although my husband, my son and I survived, I lost more than 30 relatives in the mudslides," she said. In Dongjie, two thirds of families with 848 villagers were buried when the mudslides struck. And 368 villagers have died in the disaster. Before and after the three-minute mourning, rescuers including troops and medical workers continued to clear the debris, searching for bodies and spray disinfectant in the area. Some survivors sat silently on the debris, still holding out hope that the bodies of their relatives could be found. In temporary tents, some bowed their heads, some knelt down, and some put their palms together to pray for the dead. Loud cries could be heard from time to time in the shelters. "May the deceased rest in peace. We the people who are still alive must be strong and continue our lives," said Han Ying, who lost all her family members in the disaster. Tibetans account for about a third of the total population in Zhouqu. The county sits in the steep valley of the Bailong River, a tributary of the Jialing River, which meets the mighty Yangtze River in Chongqing, and is hemmed in by rocky mountains on both sides. At the nearby Heiyu and Labrang monasteries of Tibetan Buddhism, monks and believers attended a religious ritual to mourn for the dead. In Lanzhou, the provincial capital, about 10,000 people gathered at a main square to remember those killed in the mudslide. In central Beijing, thousands of people gathered at the Tian'anmen Square early Sunday morning to watch a national flag hoisted to full height and then lowered to half-mast. A flag at half-mast is also seen at Xinhuamen, the main entrance of Zhongnanhai, the seat of the Communist Party of China and the central government, as part of the one-day national mourning. The national flags across the country and at overseas embassies and consulates were also lowered to half-mast Sunday. Public entertainment was ordered to be suspended Sunday in a show of mourning, and soon after 12 a.m. Sunday, front pages of Chinese websites turned to black and white. 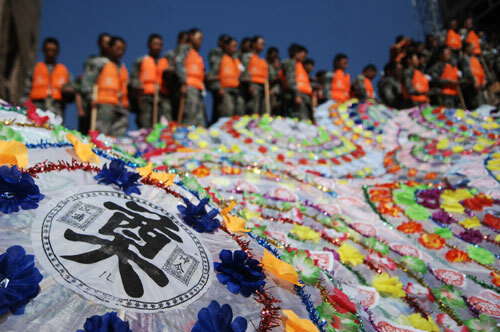 Large-scale national displays of mourning are rare in China. China observed a three-day national mourning period after the 2008 Sichuan earthquake, and a one-day national mourning after the Yushu quake in Qinghai Province on April 14 this year. On both occasions, the national flag was lowered to half-mast and all public entertainment was suspended.